Presented in collaboration with Civic Theatre of Greater Lafayette and the Purdue Black Cultural Center, Purdue Galleries presents an exhibition of paintings that respond to the contemporary challenges facing minorities in the United States. In the context of the Langston Hughes’ poem “A Dream Deferred” and Lorraine Hansberry’s play A Raisin in the Sun, Patrick Earl Hammie (Champaign, Illinois) explores the tension between power and vulnerability as he re-imagines the modern male. 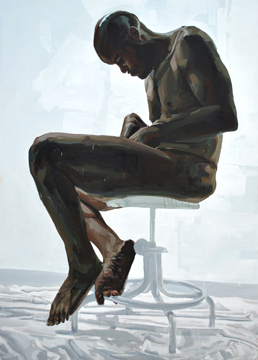 Drawing from his history as a son, a male and an African American, Hammie’s portraits symbolize his shadow-selves and visualize the effort to reconcile inner duality and transcend typical masculine ideals. The conflicts with oneself, one’s community and one’s family present in “A Raisin in the Sun” are represented in the struggles of the monumental figures in Hammie’s work. In this exhibit, he presents his paintings as platforms from which to invite discussion surrounding the principles and stances that help and hinder the journey towards one’s aspirations and identity. Civic Theatre of Greater Lafayette will present A Raisin in the Sun at the historic Monon Depot Theatre from January 19 – February 14, 2010.